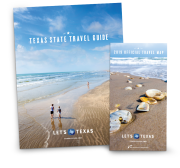 The Office of the Governor, Economic Development and Tourism (Travel Texas) is responsible for promoting Texas as a premier travel destination. The office works in concert with its partners (convention and visitors bureaus, local chambers of commerce, private travel-related organizations and associations) to promote travel to Texas in both the domestic and international tourism marketing arenas. Go to Media Resources for more information. One website can only tell you so much about Texas. For more detailed information about events, attractions, destinations and organizations, visit one of our many partners' sites.